A specialist in tectonophysical models of faulting and practically important faulting-associated processes (radon, creep and seismic activity). 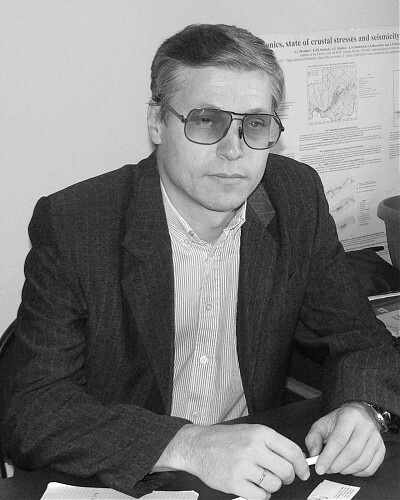 Seminsky K.Zh. 1986. Structural and Mechanical Properties of Clayey Pastes as Model Material in Tectonic Experiments. IEC SB of the USSR Acad. Sci., Irkutsk, 130 p. VINITI 13.08.86. 5762–В86. Seminsky K.Zh. 1990. General regularities of dynamics of structure formation in the large shear zones // Geologiya i Geofizika, 4, 14–23 (in Russian). Seminsky K.Zh., 1994. Principles and stages of specialized mapping of fault-block structures based on studies of fracturing // Geologiya i Geofizika, 35 (9), 112–130 (in Russian). Seminskii K.Zh. 1997. Angle relationships between conjugate joint systems near strike­slip, normal, and thrust fault planes // Doklady Earth Sciences, 354 (4), 531–533. Antipin V., Afonina T., Badalov O., Seminsky K. 2001. The new BDP-98 600-m drill core from Lake Baikal: a key late Cenozoic sedimentary section in continental Asia // Quaternary International, 80-1, 19-36. Seminsky K.Zh. 2001. Tectonophysical regularities of destruction of the lithosphere as exemplified by the Himalayan compression zone // Tikhookeanskaya Geologiya, 20 (6), 17­30 (in Russian). Seminsky, K.Zh., Karabanov, E.B. & Kuz’min M.I. (2001). – Tectonic fractures in Baikal bottom sediments (studies of BDP­98 core). – Russian Geology and Geophysics, 42 (1–2), 308–318. Seminsky K.Zh. 2003. The Internal Structure of Continental Fault Zones. Tectonophysical Aspect. GEO Branch, Publishing House of SB RAS, Novosibirsk, 243p. Seminsky K.Zh. 2004. Fault pattern in continental zones of lithospheric extension // Russian Geology and Geophysics, 45(4), 411-420. Seminsky K.Zh. 2004. Spatial regularity of fracturing in crustal fault zones // Russian Geology and Geophysics, 45(6), 660-671. Seminsky K.Zh. 2005. Mapping of the fault­block structure of the crust at the current level of development of Tectonophysics // Geophysical Journal, 27 (1), 85–96. Seminsky K.Zh., Gladkov A.S., Lunina O.V., Tugarina M.A. 2005. The Internal Structure of Continental Fault Zones. Application Aspect. Geo Branch, Publishing House of SB RAS, Novosibirsk, 293 p.
Seminskii K.Zh., Radziminovich Ya.B. 2007. Seismicity of the Southern Siberian Platform: spatiotemporal characteristics and genesis // Izvestiya, Physics of the Solid Earth, 43 (9), 726−737. Seminsky K.Zh., Burzunova Yu.P. 2007. Interpretation of chaotic jointing near fault planes: a new approach // Russian Geology and Geophysics, 48 (3), 257–266. http://dx.doi.org/10.1016/j.rgg.2007.02.009. Seminskii K.Zh. 2008. Hierarchy in the zone­block lithospheric structure of Central and Eastern Asia // Russian Geology and Geophysics, 49 (10), 771–779. http://dx.doi.org/10.1016/j.rgg.2007.11.017. Seminsky K.Zh. 2009. Major factors of the evolution of basins and faults in the Baikal rift zone: Tectonophysical analysis // Geotectonics, 43 (6), 486–500. http://dx.doi.org/10.1134/S001685210906003X. Seminsky K.Zh., Bobrov А.А. 2009. Radon activity of faults (western Baikal and southern Angara areas) // Russian Geology and Geophysics, 50 (8), 682–692. http://dx.doi.org/10.1016/j.rgg.2008.12.010. Seminskii K.Zh., Radziminovich Ya.B. 2011. Cross-sectional sizes and lateral zonality of the Baikal seismic belt // Doklady Earth Sciences, 438 (1), 645–648. http://dx.doi.org/10.1134/S1028334X11050084. Seminsky K.Zh., Cheremnykh A.V. 2011. Jointing patterns and stress tensors in Cenozoic sediments of the Baikal rift: development of the structural-genetic approach // Russian Geology and Geophysics, 52 (3), 353–367. http://dx.doi.org/10.1016/j.rgg.2011.02.008. Seminsky К.Zh., Тugarina М.А. 2011. Results of comprehensive studies of the underground hydrosphere within the western shoulder of the Baikal rift (as exemplified by the Bayandai – Krestovsky Cape site) // Geodynamics & Tectonophysics, 2 (2), 126–144 (in Russian). http://dx.doi.org/10.5800/GT-2011-2-2-0037. Seminsky K.Zh. 2012. Internal structure of fault zones: spatial and temporal evolution studies on clay models // Geodynamics & Tectonophysics, 3 (3), 183−194 (in Russian). http://dx.doi.org/10.5800/GT­2012­3­3­0070. Seminsky K.Zh., Bobrov A.A. 2012. Spatial and temporal variations of soil­radon activity in fault zones of the Pribaikalie (East Siberia, Russia). In: Li Z., Feng C. (Eds. ), Handbook of Radon: Properties, Applications and Health. Nova Science Publisher, New York, Ch. 1, р. 1–36. Seminsky K.Zh., Kоzhevnikov N.О., Cheremnykh А.V., Pospeeva E.V., Bobrov А.А., Olenchenko V.V., Tugarina М.А., Potapov V.V., Burzunova Yu.P. 2012. Interblock zones of the northwestern Baikal rift: results of geological and geophysical studies along the Bayandai Village – Cape Krestovskii profile // Russian Geology and Geophysics, 53 (2), 194–208. http://dx.doi.org/10.1016/j.rgg.2011.12.016. Seminsky K.Zh., Bobrov A.A. 2013. The first results of studies of temporary variations in soil­radon activity of faults in Western Pribaikalie // Geodynamics & Tectonophysics, 4 (1), 1−12 (in Russian). http://dx.doi.org/10.5800/GT­2013­4­1­0088. Seminsky K.Zh., Demberel S. 2013. The first estimations of soil­radon activity near faults in Central Mongolia // Radiation Measurements, 49, 19–34. http://dx.doi.org/10.1016/j.radmeas.2012.12.013. Seminsky K.Zh., Kozhevnikov N.O., Cheremnykh A.V., Pospeeva E.V., Bobrov A.A., Olenchenko V.V., Tugarina M.A., Potapov V.V., Zaripov R.M., Cheremnykh A.S. 2013. Interblock zones in the crust of the southern regions of East Siberia: tectonophysical interpretation of geological and geophysical data // Geodynamics & Tectonophysics, 4 (3), 203–278 (in Russian). http://dx.doi.org/10.5800/GT-2013-4-3-0099. Seminsky K.Z., Bobrov A.A., Demberel S. 2014. Variations in radon activity in the crustal fault zones: Spatial characteristics // Izvestiya, Physics of the Solid Earth, 50 (6), 795–813. http://dx.doi.org/10.1134/S1069351314060081. Seminsky K.Zh. 2014. Specialized mapping of crustal fault zones. Part 1: Basic theoretical concepts and principles // Geodynamics & Tectonophysics, 5 (2), 445–467 (in Russian). http://dx.doi.org/10.5800/GT-2014-5-2-0136.